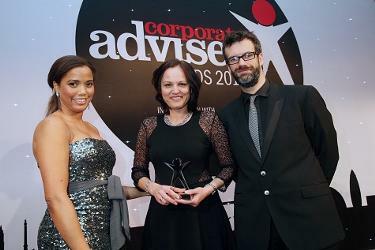 We're delighted to announce that we've won the Best Mastertrust category in this year's Corporate Adviser Awards. Accepting the award, Rosy Anand, Director of Marketing and e-Commerce in Workplace Benefits, said: "We've been pioneers of the modern mastertrust concept and our product sets the standard for others to follow. Accreditation by the Pensions Quality Mark in 2013 was a fantastic endorsement but the icing on the cake is the support and input we have from our participants. This award is recognition of all those whose efforts have made it a popular and effective option for company pension schemes." Paul McBride, Director of Legal & General Trustees Limited, who led the development of our Mastertrust, said: "Mastertrust allows companies and members to benefit from operational efficiencies borne of scale, and high standards of governance through predominantly independent trustees. Trustees have statutory duties to ensure the scheme is run in the best interests of the members at all times. Because of this, our members have the comfort of knowing there is an independent body overseeing key decisions and focussed on improving their outcomes." We were also highly commended in the Best Group Pension Provider category. Rosy added: "It was especially gratifying to be recognised in this category after all the hard work of recent years with the judges commenting particularly on our innovative solutions for SMEs approaching their auto enrolment staging dates." We were shortlisted in two other categories: Best Group Risk Provider and Ultimate Default Fund. The gala ceremony was hosted by comedian and actor Marcus Brigstocke at the Grosvenor House Hotel in London.